We describe the establishment of orthotopic colorectal tumors via injection of tumor cells or organoids into the cecum of mice and the subsequent isolation of circulating tumor cells (CTCs) from this model. Kochall, S., Thepkaysone, M. L., García, S. A., Betzler, A. M., Weitz, J., Reissfelder, C., Schölch, S. Isolation of Circulating Tumor Cells in an Orthotopic Mouse Model of Colorectal Cancer. J. Vis. Exp. (125), e55357, doi:10.3791/55357 (2017). Despite the advantages of easy applicability and cost-effectiveness, subcutaneous mouse models have severe limitations and do not accurately simulate tumor biology and tumor cell dissemination. Orthotopic mouse models have been introduced to overcome these limitations; however, such models are technically demanding, especially in hollow organs such as the large bowel. In order to produce uniform tumors which reliably grow and metastasize, standardized techniques of tumor cell preparation and injection are critical. We have developed an orthotopic mouse model of colorectal cancer (CRC) which develops highly uniform tumors and can be used for tumor biology studies as well as therapeutic trials. Tumor cells from either primary tumors, 2-dimensional (2D) cell lines or 3-dimensional (3D) organoids are injected into the cecum and, depending on the metastatic potential of the injected tumor cells, form highly metastatic tumors. In addition, CTCs can be found regularly. We here describe the technique of tumor cell preparation from both 2D cell lines and 3D organoids as well as primary tumor tissue, the surgical and injection techniques as well as the isolation of CTCs from the tumor-bearing mice, and present tips for troubleshooting. Mouse models are a powerful tool to study various aspects of cancer biology. Classical, subcutaneous tumor models are produced by subcutaneous injection of tumor cells into recipient mice, which can be either immunocompetent (if syngeneic murine tumor cells are used) or immunodeficient. Subcutaneous tumor models are inexpensive and produce data fast; their end-point tumor growth can be easily and non-invasively measured. However, 88% of new compounds that have demonstrated antitumor activity in such models fail in clinical trials.11 This is in part due to interspecies differences between humans and mice; however, a large part of this failure is due to the low predictive value of subcutaneous mouse models. The animal experiments presented here were independently reviewed and permitted by an institutional and a governmental Animal Care and Use Committee and were conducted according to Federation of Laboratory Animal Science Associations (FELASA) guidelines. All possible measures were taken to minimize suffering including anesthesia and analgesia or, if necessary, premature euthanasia. NOTE: Use a volume of 20 µL with 100,000 cells for each injection. Use basement membrane matrix (BMM) in order to prevent leakage and ensure standardized injection. In order to ensure reproducible results, conduct cell line authentication assays (e.g., via STR profiling) at regular intervals. NOTE: Always work under sterile conditions. Immediate transfer of the freshly resected tissue from the operating room to the laboratory on ice is required to ensure high viability of the cells. The patient's well-being and optimal treatment must always be the first priority. Therefore, tissue samples for research must be obtained in a manner that does not interfere with the subsequent pathological work-up and staging of the resected tumor. In most cases, it is therefore reasonable to have the samples for research obtained by a trained pathologist in order to ensure non-interference with the pathological diagnosis. Immediately after sterile removal from the resected specimen (ideally ~1 cm3), place the tissue sample in a 50 mL tube pre-filled with 20-30 mL of phosphate-buffered saline (PBS). Store the tube on ice and transfer to the laboratory immediately. Put the tissue in a Petri dish and wash it twice with plenty of PBS to remove the remaining blood. Cut the tissue into small pieces (~ 2-4 mm) with a scalpel (e.g., with a #20 or #36 blade). Use the dissociator according to the manufacturer's instructions in order to further dissociate the tumor tissue to a single-cell suspension. Alternatively, use other protocols of enzymatic tumor digestion. Count the cells of the resulting single-cell suspension (e.g., in a coulter counter or a hemocytometer). Centrifuge (5 min at 1,500 x g) and wash the cell suspension twice with PBS. Resuspend the cells in BMM at a concentration of 5 x 106 cells/mL and keep them on ice. Grow all colorectal cancer cell lines under standard culturing conditions (37 °C, 5% CO2) and prepare them at the day of surgery. Harvest the cells according to standard cell culture protocols, count the cells (e.g., in a coulter counter or a hemocytometer) and calculate the required amount for all injections depending on the numbers of animals to be injected. Prepare 3-5x of the actually needed volume to account for pipetting losses and the dead volume of the injection syringe. Centrifuge (5 min at 1,500 g) and wash the cell suspension twice with PBS. Prepare the following medium (in the following referred to as DMEM/F12+++): Advanced Dulbecco's Modified Eagle's Medium (DMEM)/F12 + 1% HEPES (1M) + 1% Glutamine (200 mM) + 1% Penicillin/Streptomycin. Pre-fill 15 mL tubes with 1 mL DMEM/F12+++. Carefully aspirate the organoids from the surface of the culture plate and transfer the contents of 3 to 5 wells into one 15 mL tube. Carefully break the organoids up into smaller pieces by pipetting them up and down with an extended glass pipette. Add 5 mL DMEM/F12+++ to the tube, followed by centrifugation at 1,000 x g for 5 min. After centrifugation, remove the supernatant, resuspend the pellet in 600 µL enzymatic dissociation buffer and transfer the suspension to one well of a 6-well plate. Incubate at 37 °C for 1-5 min and then carefully pipet the suspension up and down in order to dissolve the organoids. NOTE: Verify the digestion via microscope; it is complete when all cell clusters have been dissociated to single cells. Upon successful digestion, add 1.4 mL of DMEM/F12+++ to stop the digestion. Then transfer all wells of digested organoids to a 50 mL tube. Count the cells and calculate the required amount for all injections. Resuspended the cells in BMM to a concentration of 5 x 106 cells/mL and keep them on ice. NOTE: Use 6-8 week-old NOD.Cg-Prkdcscid Il2rgtm1Wjl/SzJ (NOD scid gamma, NSG) mice as recipients.21 NSG are among the most immunocompromised mice, lacking mature B, T and NK cells along with multiple other immune defects.21 They reliably grow tumors even if low cell numbers are injected and are highly prone to distant metastases. NSG mice are excellent breeders and can be kept in conventional specific pathogen free (SPF) units. Use sevoflurane at 3-3.5 vol% for general anesthesia. A loss of the toe pinch reflex indicates sufficient anesthesia. Shave the abdomen with an electric shaver (depilatory cream can be used alternatively) and disinfect with at least 3 times clorhexidine/iodine and 70% alcohol alternatively. Use scissors (scalpels can be used alternatively) to make a small midline incision (3 - 5 mm) of the skin on the lower abdomen. Pick up the abdominal wall musculature with forceps and carefully incise it with scissors, thus opening the abdominal cavity. Identify and carefully exteriorize the cecum with atraumatic forceps. Position the blind ending pouch of the cecum on the abdomen pointing cranially. Once exteriorized, keep the cecum moist using warm saline swabs at all times. For intracecal injection, use a standard 1 mL syringe with a 30 G cannula. Mount this syringe on a microinjection pump, which is in turn mounted on a micromanipulator. Carefully grasp the tip of the cecum with atraumatic forceps and gently smoothen it by stroking it downward with a second set of forceps moistened with warm saline. Position the cannula directly above the cecum. Perform the following steps under visual control with a binocular surgical microscope. Carefully grasp the cecum with two atraumatic forceps at both ends of the exteriorized part of the cecum, slightly stretch it and then slowly pull it over the cannula which is positioned parallel and directly above. It is crucial not to perforate the entire bowel wall (thus injecting the cells into the lumen) as well as not to perforate the serosa beyond the initial point of penetration, as this would lead to leakage and peritoneal dissemination. Move the bowel towards the cannula, not the cannula towards the bowel. Hold and stretch the bowel between two forceps. The surgeon's hands must be resting on a surface in order to reduce tremor. Inject the cells between the serosa (seen as very thin, translucent lining above the intramural blood vessels) and the muscularis. The cannula must therefore be visually placed above the blood vessels and underneath the thin translucent membrane. Use a foot switch to start the injection in order to reduce tremor while the cannula is inside the bowel wall. Once the cannula is in position, start the injection. Use a duration of 20 s, resulting in 1 µL/s setting on the control unit of the pump. NOTE: The injection into or near a damaged blood vessel leads to direct intravascular dissemination and distant metastasis and should therefore be avoided. After completion of the injection, carefully remove the cannula by pulling it backward. Place a dry swab under the cecum, and then thoroughly rinse the cecum with distilled water in order to lyse leaked cells and thus prevent artificial peritoneal dissemination. After rinsing, gently return the cecum to the abdominal cavity. Close the abdominal wall with 6-0 rapidly absorbable running sutures. Place the mouse on a heating map set to 38 °C until it has fully recovered from the anesthesia. Closely observe the postoperative condition of the mice for the following 48 h. In case of distress, treat with 0.05 mg/kg buprenorphine every 12 h.
NOTE: Obtain blood by transcutaneous cardiac puncture on anesthetized mice, followed by euthanasia. Ideally, 1,000 µL of blood are drawn into a syringe prefilled with 100 µL of an anticoagulant (Ethylenediaminetetraacetic acid (EDTA) or heparin). Use an anti-human-EpCAM (epithelial cell adhesion molecule) antibody to identify the CTCs. This works very well if human epithelial cell lines are used in the mouse model. For other appliances, different antibodies may be required. Pre-fill 15 mL tubes with 5 mL density gradient medium and carefully transfer the blood into the 15 mL tube. Centrifuge (30 min at 300 x g without brake) and carefully remove the upper supernatant. Pour the rest into a new 15 mL tube and centrifuge (15 min, 300 x g with brake). Recover the interphase containing the mononuclear cells (discard the rest) and wash the cells twice with PBS. Resuspend the pellet in 200 µL PBS/1% EDTA and add 4 µL of EpCAM antibody. Incubate 20 min on ice in the dark. Prepare the following buffer (in the following referred to as picking buffer): PBS + 10% fetal calf serum (FCS) + 1% Penicillin/Streptomycin (1%) + 0.8% EDTA. Use a PAP pen to draw a ~1 cm circle in a 6 cm sterile Petri dish (prevents the fluid from dispersing in the dish), and pipet 700 µL of picking buffer into this circle. Add 50 µL of cell suspension to the 700 µL picking buffer within the circle. Check the density of cells with the microscope. Split the sample into different dishes if it is too dense. Wait for the cells to settle down (~5 min). Screen the drop of cell suspension for stained (= EpCAM-positive) cells. Once a cell is found, pick the cell with the micromanipulator and put it in 50 µL buffer depending on the intended downstream analysis (e.g., RNA extraction buffer or culturing medium). Depending on the intended downstream analyses, isolate EpCAM-negative cells and/or medium as negative controls. Proceed with downstream analyses (e.g., cell culture, PCR). The use of HCT116 cells in this model reliably results in moribund mice within 35 days of tumor cell injection. Primary tumors measure about 10 mm in size (Figure 1A and Figure 2A), liver metastases (Figure 1B and Figure 2B), lung metastases (Figure 1C and Figure 2C) and circulating tumor cells (Figure 3) are almost invariably present. In mice bearing HCT116 tumors, 35 days after tumor cell injection CTCs are present in high frequency and quantity and can be easily isolated for downstream analyses (Figure 3). 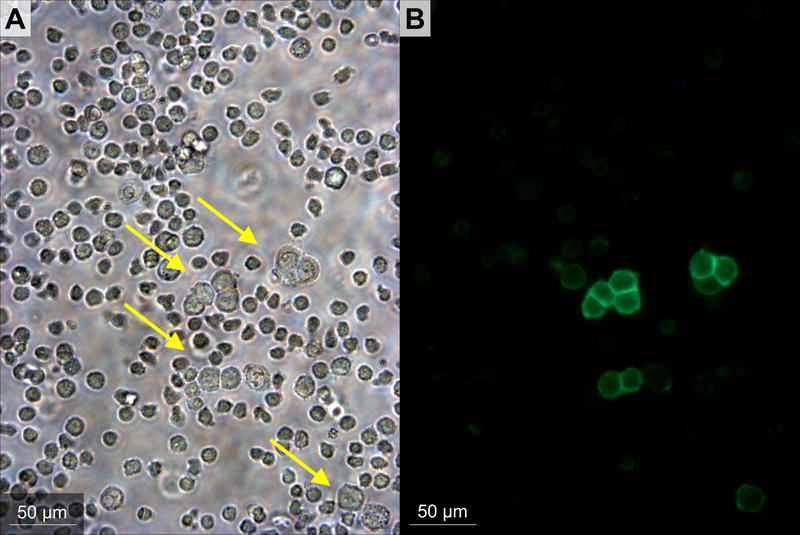 Figure 1: Macroscopic Pictures after Dissection 35 days After the Orthotopic Injection of HCT116 Human CRC Cells into NSG Mice. (A) Primary tumor (dashed line) in the cecum. (B) Liver with multiple metastases. (C) Lung metastases (arrows). Please click here to view a larger version of this figure. Figure 2: Histological Pictures of the Organs Shown in Figure 1. (A) Primary Tumor (H&E). (B) Liver metastasis (H&E). (C) Lung metastasis (anti-EpCAM immunohistochemistry). Please click here to view a larger version of this figure. Figure 3: Circulating Tumor Cells (HCT116 Cells in NSG Mice, 35 Days after Tumor Cell Injection). Bright field (A) and immunofluorescence (anti-hEpCAM-Alexa488 (B)) images of CTCs in the peripheral blood mononuclear cell (PBMC) fraction. Please click here to view a larger version of this figure. Despite their preclinically proven activity in subcutaneous mouse models, the great majority of novel compounds fail in clinical trials and never reach the clinic.11 This obvious insufficiency of subcutaneous mouse models to accurately simulate the biology and growth patterns of tumors has led to the development of orthotopic mouse models based on the injection of tumor cells directly into the original organ. Orthotopic mouse models are able to simulate the biology and dissemination of solid tumors much more accurately than subcutaneous models.15 However, major disadvantages are poor reproducibility especially in technically demanding organs such as hollow organs as well as the technically demanding monitoring of the tumor growth. In our model, we have therefore focused on tumor size at a pre-defined time point rather than repeated imaging procedures, which limits the number of technically elaborate and for the animals' stressful examinations. The here described model can be used for various applications such as characterization of tumor cell lines,15 investigation of tumor biology and dissemination as well as therapeutic trials.17 Obvious end-points are the size of the primary tumor and the number of distant metastases, but more elaborate end-points such as CTC numbers17 or imaging modalities can also be employed. The here described highly controlled injection technique leads to highly reproducible tumor growth and dissemination and distinguishes this model from previously described orthotopic models.24 In addition, rinsing the cecum with distilled water after tumor cell injection dramatically reduces the rate of artificial peritoneal dissemination; therefore, if peritoneal carcinomatosis occurs in our model, it is most likely a result of the biology of the cell line rather than an iatrogenic tumor cell leakage. Limitations of this model are the recipient mice which have to be immunodeficient if human cell lines are to be used. This severely limits the model's application in immunological studies. However, this limitation can be overcome by the use of syngeneic murine cell lines or organoids (unpublished data). Another limitation is the use of cell lines themselves. Tumor cell lines are often highly anaplastic, which leave questions about their representativeness of the original tumor's biology. This limitation is not present in genetically engineered mouse models (GEMMs), which develop a new tumor by the introduction of tissue-specific oncogenic mutations.12 Such GEMMs are usually based on conditional germ-line mutations (e.g. a floxed Apc gene) and Cre-mediated activation of the mutations, either by local infection with adeno-cre25,27,28 or a tissue specific promoter driving cre expression.29,30,31 However, such models often require extensive crossings and have a highly variable biology. If primary cell lines are used in the here presented model, the limitation of low representativeness can be overcome without the loss of the other advantages of our model such as reproducibility and relative cost-effectiveness. Another limitation of the here proposed technique is the dependency on EpCAM as a surface marker. It is well known that EpCAM can be lost during EMT and that there is a fraction of CTCs that are EpCAM negative.10,15 Therefore, depending on the aim of the experiment and the cell lines used for injection, other means of identification (e.g., GFP-labelling of the cells prior to injection) may be used. This work was supported by the German Research foundation (WE 3548/4-1) and Roland-Ernst-Stiftung für Gesundheitswesen (1/14). Weitz, J., Koch, M., Debus, J., Höhler, T., Galle, P. R., Büchler, M. W. Colorectal cancer. Lancet. 365, (9454), 153-165 (2005). Schölch, S., et al. Circulating tumor cells of colorectal cancer. Cancer Cell Microenviron. 1, (5), (2014). Bork, U., et al. Circulating tumour cells and outcome in non-metastatic colorectal cancer: a prospective study. Br J Cancer. 112, (8), 1306-1313 (2015). Rahbari, N. N., et al. Compartmental differences of circulating tumor cells in colorectal cancer. Ann Surg Oncol. 19, (7), 2195-2202 (2012). Rahbari, N. N., et al. Metastatic Spread Emerging From Liver Metastases of Colorectal Cancer: Does the Seed Leave the Soil Again? Ann Surg. 263, (2), 345-352 (2016). Rahbari, N. N., et al. Meta-analysis shows that detection of circulating tumor cells indicates poor prognosis in patients with colorectal cancer. Gastroenterology. 138, (5), 1714-1726 (2010). Steinert, G., et al. Immune Escape and Survival Mechanisms in Circulating Tumor Cells of Colorectal Cancer. Cancer Res. 74, (6), 1694-1704 (2014). Schölch, S., Rauber, C., Weitz, J., Koch, M., Huber, P. E. TLR activation and ionizing radiation induce strong immune responses against multiple tumor entities. Oncoimmunology. 4, (11), e1042201 (2015). Boj, S. F., et al. Organoid models of human and mouse ductal pancreatic cancer. Cell. 160, (1-2), 324-338 (2015). Gao, D., et al. Organoid cultures derived from patients with advanced prostate cancer. Cell. 159, (1), 176-187 (2014). Ito, M., et al. NOD/SCID/gamma(c)(null) mouse: an excellent recipient mouse model for engraftment of human cells. Blood. 100, (9), 3175-3182 (2002). Simon, M. M., et al. A comparative phenotypic and genomic analysis of C57BL/6J and C57BL/6N mouse strains. Genome Biol. 14, (7), R82 (2013). Kalish, S., et al. C57BL/6N Mice Are More Resistant to Ehrlich Ascites Tumors Than C57BL/6J Mice: The Role of Macrophage Nitric Oxide. Med Sci Monit Basic Res. 21, 235-240 (2015). Tseng, W., Leong, X., Engleman, E. Orthotopic mouse model of colorectal cancer. J Vis Exp. (10), e484 (2007). Roper, J., et al. Combination PI3K/MEK inhibition promotes tumor apoptosis and regression in PIK3CA wild-type, KRAS mutant colorectal cancer. Cancer Lett. 347, (2), 204-211 (2014). Coffee, E. M., et al. Concomitant BRAF and PI3K/mTOR blockade is required for effective treatment of BRAF(V600E) colorectal cancer. Clin Cancer Res. 19, (10), 2688-2698 (2013). Belmont, P. J., et al. Resistance to dual blockade of the kinases PI3K and mTOR in KRAS-mutant colorectal cancer models results in combined sensitivity to inhibition of the receptor tyrosine kinase EGFR. Sci Signal. 7, (351), ra107 (2014). Wang, F., Johnson, R. L., Snyder, P. W., DeSmet, M. L., Fleet, J. C. An Inducible, Large-Intestine-Specific Transgenic Mouse Model for Colitis and Colitis-Induced Colon Cancer Research. Dig Dis Sci. 61, (4), 1069-1079 (2016). Xue, Y., Johnson, R., Desmet, M., Snyder, P. W., Fleet, J. C. Generation of a transgenic mouse for colorectal cancer research with intestinal cre expression limited to the large intestine. Mol Cancer Res. 8, (8), 1095-1104 (2010). Tetteh, P. W., et al. Generation of an inducible colon-specific Cre enzyme mouse line for colon cancer research. Proc Natl Acad Sci USA. 113, (42), 11859-11864 (2016).